The below FAQ section allows you to view some common questions that have been asked, and also allows you to ask a new question you may have. We will respond to all questions personally via email. If we post a question to the FAQ’s, your privacy is of the utmost importance to us, and we will remove anything that identifies you with the original question. We will never market or sell your email and/or contact details. As always, you can contact us via traditional means from the contact page if you need further support. 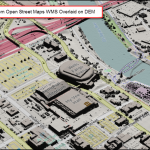 What grid sampling should I use when building a DEM or DSM? The grid sampling (equivalent to pixel size) is essentially the resolution of the end raster product. When deciding on a grid sampling, one should consider the point spacing of the source point cloud and the ultimate use of the raster product. Users tend to use a 1:1 ratio of point spacing to grid sampling so that a point would theoretically fall within each grid cell (of course LiDAR is irregularly spaced so this does not always happen). Reasons to use a larger grid sampling than the point spacing include file size, amount of available RAM, and geographic area. For each halving of the grid sampling, the file size is increased by 4 times. What license type should I use? The Quick Terrain Modeler is available in Node, Portable, and Floating versions for both 32 and 64 bit operating systems. The Node version is locked to a specific hardware fingerprint and is appropriate for a single LiDAR Workstation or a commonly used Laptop on the go. The Portable version requires a USB dongle installed locally to the machine and is appropriate for a small office where multiple users require access to the software for a short duration. The Floating version accesses the license(s) over a network (via USB Dongle or FLEX) and is appropriate for multiple users and, when multiple licenses are available, allow for concurrent access. Please contact info@appliedimagery.com for more information and/or pricing. Why am I getting a “No Points Read” error? There are two common reasons for the no points read error. The first is if a user is importing ASCII XYZ data. Because ASCII XYZ is not standardized and is a flat text file, the user must define the x, the y, and the z (and intensity if it exists) columns in the Import Settings window. If these columns are not entered in properly, the software is unable to read the points. The second common reason for the error is using LAS data. In the LAS Import Settings window, if a user has set the software to filter on a given classification, and that classification does not exist in the data, then the error will occur. What can I do to make my point clouds and surface models look better? There several visualization techniques that will greatly improve model appearance. Since there is no area or volume associated with a given point, it is very important to set the Cloud Point Size button and algorithm appropriately for your data. This will make the individual points larger or smaller. For the surface models, the overall lighting is very important. Click the Set Lighting button on the tool bar and configure the lighting to desired intensity and angle. More oblique angles will increase the shadows and relief appearance while less angle will increase overall brightness. Why can’t I see my intensity or analysis results? When intensity and other LiDAR attributes are imported, they are stored in a QTA file. A given attribute can be pushed into the vertex channel for display. On import, this is typically the Intensity, but you can push any value you want in to the vertex channel by clicking the QTA button on the toolbar. Once the data is in the vertex channel, make sure the TOGGLE VERTEX CHANNEL button on the toolbar is pushed in. Analysis results such as LOS, HLZ, and Slope are also pushed in to the vertex channels of QTTs. Why can’t I see my imagery? Imagery is handled as a texture in the Quick Terrain Modeler. Once the imagery is loaded by going to Textures > Overlay Textures, one should make sure the TOGGLE TEXTURES button is pushed in. Similarly, you can make sure the texture is turned on by clicking the checkbox next to the texture name in the Layer Tree on the left hand side of the screen. Use the blue/red height color palette rather than earth tones. This makes individual points “pop” visually. Turn off intensity/vertex colors. While intensity is useful in most cases, it just moderates the point color when performing a visual scan, thus minimizing the brightness of individual points. Make points larger in the “set point size” tool. Tilt the model on its side so you can scan “across” it. Keep the point cloud moving – your eye will spot things better if the point cloud is in motion – even if just a little “back and forth”. If you have LAS files with multiple returns, use the QTA Quick Color button to color by “First/Last/Intermediate”. Vegetation and Power lines will be obvious. It may be helpful to document towers with a marker. Hold down “SHIFT” to interrogate individual points, then click “Create Marker” to drop a marker onto the VO. Markers can be exported as SHP, KML, or ASCII text files, or sent downstream to other QT Modeler/QT Reader users as a native QTM format. Why am I running out of memory? RAM is used by the Operating System and programs to temporarily store data for immediate accessibility. The Quick Terrain Modeler uses available RAM when point clouds and surfaces are loaded. If no additional RAM is available for the Quick Terrain Modeler, a memory error may popup. On a 32 bit Operating System, only 2 GB of RAM can be allocated to a given process. On today’s machines, 64 bit Operating Systems are only limited by the amount of installed RAM and thus larger amounts of data can be loaded. What imagery formats can I overlay in Quick Terrain Modeler? The Quick Terrain Modeler utilizes the GDAL library for raster support. Some common imagery formats that are natively supported are GeoTIF, TIF, JPG2K, IMG, MrSID, and ECW. For DoD users attempting to overlay TFRD imagery, please note that QT Modeler does not read TFRD files natively. Reading TFRD would require a classified plug-in that Applied Imagery is not likely to support in the near term. A quick workaround is to convert the TFRD image to NITF in an ELT software package (e.g., Remote View), then overlay the converted NITF image in QT Modeler. To see if your other imagery formats are supported or to make a request, please contact support@appliedimagery.com. The Quick Terrain Modeler can search through a directory and find a geospatial file that intersects with a given coordinate. In the File > Model Search window, enter the drive/directory where the file is stored and the coordinate. Click Find Model and the window will populate with all the recognized geospatial files (LAS, QTC, QTA, GeoTIF, IMG, etc). The Find Model tool can also be opened and the coordinate prepopulated by clicking the “F” key when your mouse is hovering over a specific feature. This is helpful to find any other collections that contain a given coordinate. Export > Create File Index is an indexing capability where QTM will search the selected directories and generate a vector outline of each geospatial file recognized by QTM such as LAS, QTC, QTT, SHP, GeoTIF, IMG, etc. The outline and/or attribute information can then be saved as a SHP, KML, KMZ, or CSV file. How can I quickly place markers? Markers can be created quickly by holding down the “m” key and left clicking the mouse. A new marker is created wherever the cursor position is when the mouse is clicked. A custom name and numbering convention can be added by going to Markers > Marker Options and setting the default name and base number. For example, one may want to place markers on each building on a given block. The user would go to Markers > Marker Options and enter “Building” as the default name and “1000” as the base number. Click Apply to accept the changes and close the window. Now, hold down “m” and left click each building with your mouse. Markers will be created at each click with the labeled marker name as “Building 1001”, “Building 1002”, etc. Markers can be imported and exported as mrk, shp, kml, and text (ascii txt). NITF Wrapping: Wrapping a LAS point file in NITF does not alter the content of the LAS file itself. It simply “wraps” the file with a NITF-compatible wrapper so it can be stored in systems designed exclusively for classified data. It does, however, change the extension of the file to “.ntf”. It may also cause the file to be unreadable in many applications. QT Modeler and QT Reader both seamlessly unwrap NITF LAS files. Furthermore, NITF wrapped files will appear in search results from QT Modeler’s “Model Search” tool (File Menu…Model Search) as well as in indexing operations to catalog your data holdings in SHP/KMZ format (Export Menu…Create File Index). Variable Length Record (VLR): The VLR is simply additional, informative text that is written in the LAS header. NGA writes information such as collection data, collection platform, classification level, etc. This process is technically independent of the NITF wrapping noted above, but frequently happens together. QT Modeler’s data preview capability (i.e., looking at the header information when you open/import a file) will enable you to read the NGA VLR prior to opening or importing a LAS file.